The US Department of Defense says Alaska is its preferred location to deploy a new long-range “must-have” radar to enable missile defense systems to better intercept potential enemy threats, such as from Iran or North Korea. The Pentagon says that the new Long Range Discrimination Radar (LRDR) will begin defensive operations in 2020 and will boost the capacity of ground-based interceptors in Alaska and California. 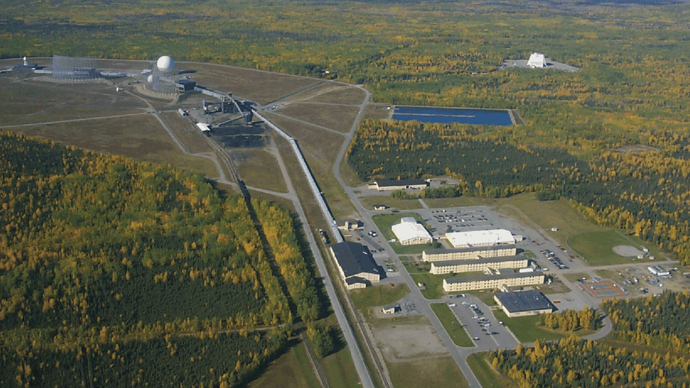 The Clear Air Force Station, an Air Force Space Command radar station in central Alaska, has been chosen as the preferred location for the radar. "The new LRDR will serve as a midcourse sensor to improve target discrimination capability for our Ballistic Missile Defense System (BMDS) to better address potential countermeasures and increase the capacity of the ground-based midcourse defense (GMD) inventory of interceptors in Alaska and California,"the Pentagon said in a statement. The Missile Defense Agency is currently busy working on the design and development of the radar, assessing industry proposals "to meet the required technical performance to counter the emerging threat and support future BMDS architecture needs." Major US defense contractors such as Raytheon (the world's largest producer of guided missiles), Northrop Grumman (the world's fifth-largest defense contractor) and aerospace giant Lockheed Martin are competing to build the new radar, which, according to Reuters, is expected to cost just under $1 billion. The Missile Defense Agency invited bids in January and is expected to award a contract by the end of September. According to Missile Defense Agency director James Syring, the new radar will be crucial in combating the growing capabilities of North Korea and Iran. “The LRDR is critically important to where I see the threat from North Korea going in the near future, with the capability of becoming more complex, requiring more interceptors,” Alaska Public Media quoted Syring as saying in March. Earlier this week, Admiral James Winnefeld Jr,, chairman of the US Joint Chiefs of Staff, told the Washington-based Center for Strategic and International Studies that the number of countries trying to achieve the capability to carry out "catastrophic attacks" on the US is "growing, not shrinking." Winnefeld said that "our most immediate concern, of course, being North Korea because they're closest in terms of capability, followed by Iran." "A robust and capable missile defense is our best bet to defend the United States from such an attack," Winnefeld said Tuesday. He earlier described LRDR as a “must have” radar to “keep our nation ahead of the threat,”Alaska Native News reported. According to Missile Defense Advocacy Alliance, Alaska’s unique geostrategic location makes it the “only state from where one can defend all 50 states from a long range ballistic missile attack coming from the Northern Hemisphere, both east and west, from Hawaii to Florida.” Two of the main land-based sensors for tracking the North Korean missile threat are located in Alaska.